I am an artist, designer, and maker. As the Director of The Hacktory, I am working to create a beginner-friendly environment where anyone can explore their interests in technology and art. Last year I had the honor of being named Philly's "Hacker of the Year" by the blog Geekadelphia. I also work as a designer at the Action Mill, a company that designs tools to improve how people work, transform complex systems, and create more meaningful connections. 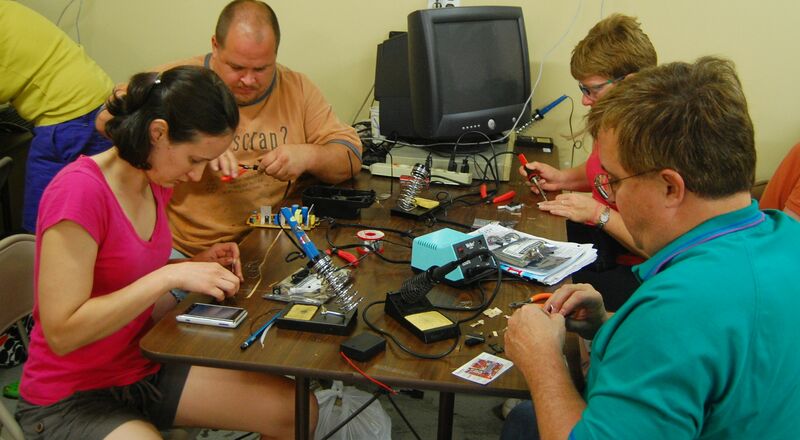 If you’ve been to your local hacker/makerspace and there weren’t many women, did you stop and wonder about that? I hope so, but unfortunately a common reaction is to think, “I guess women just aren’t into building stuff.” As one of the few women directors of a U.S. makerspace, I know that this just isn’t true. In this and future posts I’d like to share my perspective on the problem, and what I think can be done about it. At The Hacktory in Philadelphia, Pa., getting more women involved in our organization and creating a welcoming environment for everyone has become one of our defining strengths. When I was nominated to be the director of The Hacktory a few years ago, I doubted that I had enough technical expertise, but I decided to give it a try because it seemed like a huge opportunity to make the organization as inclusive as possible. Today The Hacktory has more female-bodied organizers than male-bodied ones, and everyone continues to develop and reveal technical skills that are really amazing. Frustratingly, at many tech conferences we’ve attended, panels on the gender gap often devolve into blame sessions rather than focusing on what to do about it. So, last year when The Hacktory was asked to provide a workshop for the first Women in Tech Summit in Philadelphia, we decided to take a deeper look at the issue of the gender gap in tech specifically. We were inspired to do this first after hearing many illuminating stories from our volunteers. Many of us had been interested in science, math, and technology as kids, and then drifted away from it at some point. Often this happened in our late teens, but then we found our way back through a work environment or a hobby, or both. According to official research, such as the 2010 study “Why So Few?” by the AAUW, girls start to lose interest in STEM topics around middle school. We wondered if the experiences of these girls “losing interest” had anything in common with ours. Though we couldn’t ask the girls who had been studied in the official research, we could start collecting stories from those in our community. From my training as a strategic designer, I knew that stories are a powerful way for people to comprehend data and experience. Understanding the problem of the gender gap as it is experienced on an individual day-to-day level could give crucial context. My hope was that themes and patterns would emerge from this additional information that could be used to form actionable steps to change the situation. With the help of Stephanie Alarcón, a Hacktory organizer who had already done a significant amount of research on the gender gap, and our awesome team at The Hacktory, we created a workshop to do just that. Along the way I got some feedback from my colleagues at the Action Mill, a strategic design company where I work. They helped me simplify the activity and instructions to maximize its impact. In our workshop, Hacking the Gender Gap, we present a brief overview of the published research on the gender gap and women’s history in computing. Then we pass out two different colors of large Post-Its and markers. 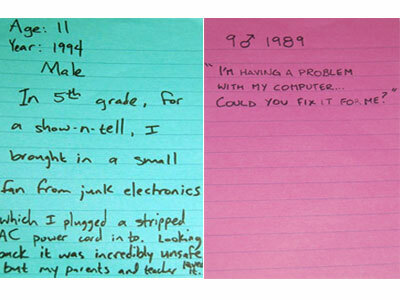 On one color, we ask participants to write a story of a negative experience they’ve had with technology. On the other color, we ask them to write a positive experience. Additional information such as the age and year the experience happened are also requested. For our purposes, we define “technology” as whatever comes to mind for the participants. It could be software, hardware, hand tools, or video games. 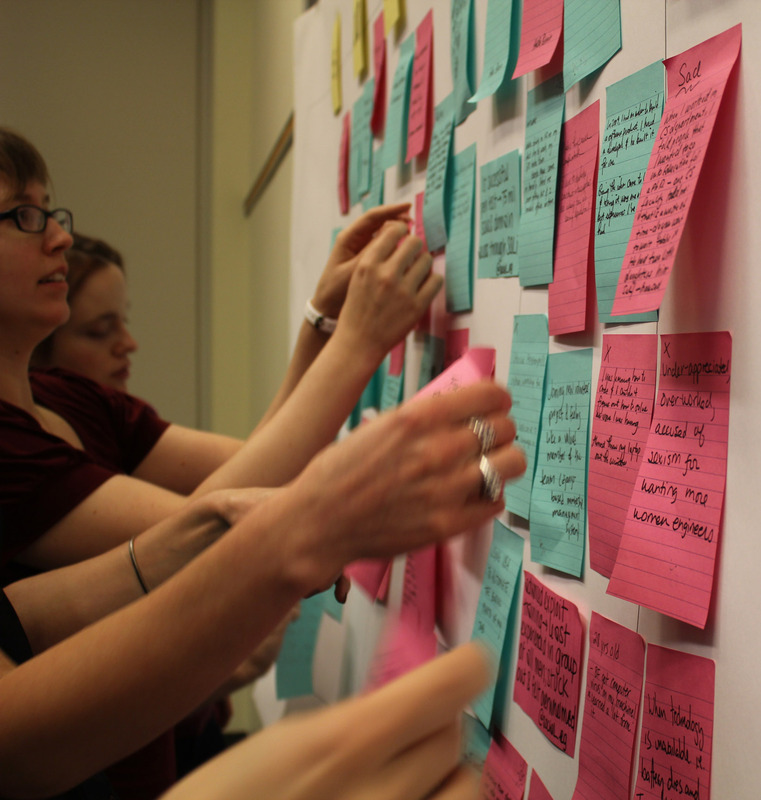 When they’re finished, everyone places the stories on a timeline taped on the wall, ordered by the how old the participants were when the experiences happened. As a group, we read the stories and discuss the themes that emerge, and what could be done to encourage more of the positive experiences and prevent the negative ones. Hacking the Gender Gap workshop (photo by Corinne Warnshuis). We’ve done the activity six times now, in six different groups, and in each instance, the room goes quiet as we read the Post-Its. Many of the experiences are similar from one group to the next, and the same themes have emerged in every group, but the individual stories are incredibly compelling. Many positive stories involve a fun tech-oriented activity with a parent, like learning to program or working with power tools. Another common theme is a family member getting the individual a computer or video game system, which they use to build websites or gain confidence in their skills. As the ages increase, stories about figuring out a tough technical problem are also more frequent. Themes From the positive stories. Stories of supportive comments by a teacher, tutor, classmate, or co-worker appear often, which shows how much of an impact they make, in the moment and for many years afterward. Every group has several negative stories of teachers, guidance counselors, or other advisors being directly discouraging of girls’ interest or questioning their abilities in technology, science, or math. Sometimes the comments are probably unintentional, like a computer science tutor saying, “I don’t know why this is so difficult for you, it’s so easy.” Sometimes they are direct and brutal, like a female chemistry teacher with a Ph.D. telling her students “women are bad at science.” When we sort the stories by year, these stories appear in every decade, which indicates that the old stereotype that “girls are bad at math and science” is still shockingly pervasive. Negative themes have emerged too. Work environments are another common setting for discrimination or alienation that make participants feel extremely frustrated and helpless. Computer science departments in colleges and universities are especially hostile, though it’s sometimes hard to tell whether they are more hostile to women or beginners. These themes are anecdotal and definitely subjective, but after each group reads through the stories and we ask for their thoughts, they voice the same interpretations. If you’d like to read the stories yourself, they are up on our Flickr page. When reading through the stories we often hear women say, “I thought it was just me!” Recognizing that we have so much experience in common is really empowering. Many women express relief and thanks at being able to share their experiences, both positive and negative, in a non-judgmental environment, and have those experiences contribute to a larger outcome. The results became more interesting and nuanced when we held the activity with a mixed-gender crowd. The first time we did was last summer at HOPE, a large hacker conference. After we had passed out the Post-Its and markers and given the instructions, some of the men looked puzzled. After a few moments one of them asked, “What do you mean by a ‘negative’ experience with technology?” This question was something we had never heard before. Further discussion revealed that he had experienced his share of negativity in tech, but the instances all involved other people, not the technology itself. This seemed like an important distinction to us, and something women can definitely relate to. One important theme that emerged from the men’s stories was frustration with women asking for help with a technical problem, with the assumption that the men can fix it just because they are men. These stories helped us understand for the first time how our culture’s association of masculinity with technical ability is perpetuated by people of all genders. In my opinion this point is pivotal, because it shows how the problem is systemic and no one single group is to blame for it. The stories we’ve gathered also show an incredible range of technology involved, from coding with pencil and paper, to building websites at the age of nine. Imagining early experiences with such different technologies has made us wonder if this is another kind of gap, one of age and type of technology, that further hinders people from relating to each other’s experiences in the tech world. There are probably other gaps based on ethnicity, socioeconomic status, and whether the participants self-identify as “tech-savvy” or not. We’re interested in exploring all of these and sharing our findings. Our next iteration of the workshop is a web app to display and collect stories from anyone, with the ability to filter the stories by criteria such as the type of technology used, the situation (school, work, etc. ), age, and calendar year. We are also creating a facilitator’s kit with instructions and presentation materials for anyone to lead the workshop in their local makerspace, school, or workplace. Discrimination among adults in the tech world is widespread, and some of it is pretty extreme. Many women at tech conferences have experienced physical and emotional abuse and harassment. Discrimination through comments and trolling is pervasive and well-documented in the gaming world and in the open source community. 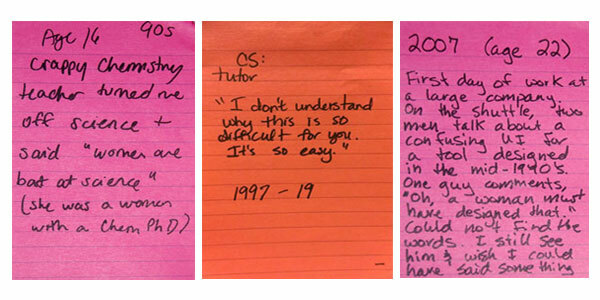 The website GeekFeminism.org has a timeline where anyone can submit a relevant incident. Unsurprisingly, this makes women wary of becoming involved in their local tech or maker scene. So what can a hackerspace/makerspace do to get women to start participating in their space and retain them? 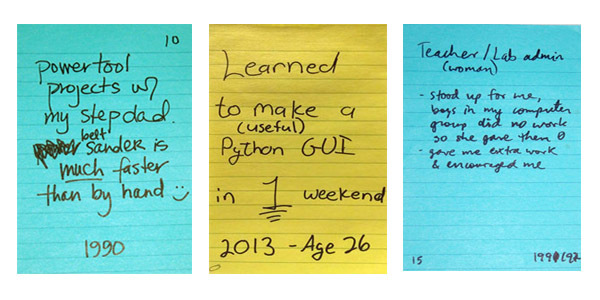 I’d like to explore this topic more in my next post, and share some of what we’ve learned at The Hacktory. Georgia Guthrie is a designer and maker based in Philadelphia, Pa. She works at the Action Mill, where she uses design thinking to help solve big, intangible problems. Georgia is also the director of The Hacktory, where she works to create opportunities for anyone to creatively tinker and learn about technology.